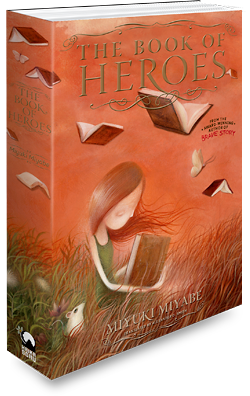 ﻿ THE BOOK OF HEROES « Haikasoru: Space Opera. Dark Fantasy. Hard Science. When her brother Hiroki disappears after a violent altercation with school bullies, Yuriko finds a magical book in his room. The book leads her to another world where she learns that Hiroki has been possessed by a spirit from The Book of Heroes, and that every story ever told has some truth to it and some horrible lie. With the help of the monk Sky, the dictionary-turned-mouse Aju, and the mysterious Man of Ash, Yuriko has to piece together the mystery of her vanished brother and save the world from the evil King in Yellow. U-ri stepped between Ash and the devout. She felt like she had to protect her servant, though she wasn’t sure why. “Look, when The Hero broke free of its prison the Hollow Book was damaged.” U-ri quickly began to explain all that had happened in the Dome of Convocation–mixing her own thoughts with what the Archdevout had told her. Ash listened without blinking. It was less like he was actually listening and more like he was simply letting U-ri explain herself into exhaustion. When she paused, he looked again at Sky. U-ri glanced sidelong at Sky. He looked confused. When he began to speak, he did so shakily. “That’s enough,” Ash grunted, cutting him off.